Ever want to get out of the house even though you have no real desire to interact with other human beings? There’s an app for that! Avoid Humans is the new web app that will warn you about which restaurants, bars and museums are more packed with the yelling, stinking, socializing masses (so you can avoid them, obviously) and it’s poised to become the preferred tool of misanthropes everywhere! That was the good news. 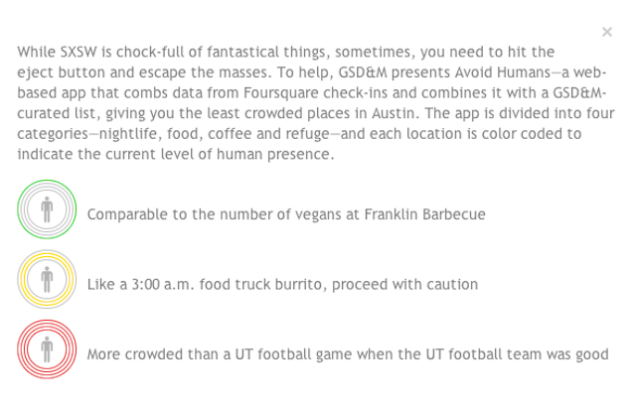 Now the bad: As of now, it’s only available for Austinites looking to avoid the crowds at SXSW. UGH, humanity has failed you again! Scott Brewer, a creative director at Austin ad agency GSD&M, says the development took place in-house, as part of a continuing series of SXSW initiatives from the company. It’s web only, and powered by a Foursquare engine, so it gathers check-ins from places in your proximity—specifically bars, restaurants, coffee shops, and places of “refuge” like parks and museums—then gives you a handy red, yellow, or green light for how to proceed. To be fair (sorry, I know patience with others is not your strong suit), the people of Austin really could use an app like this right now. SXSW, as one colleague described it, is hipster spring break and the city is being descended upon by every ukulele-owning, mumblecore-loving tech blogger (there are more than you think!) in the country. Understandably, locals need a tool to help them find places to go to where there won’t be gigantic masses of tourists — places where they can just be themselves and keep Austin weird. But what about those of us who reside outside the Lone Star State, but still wish to avoid other people as if they have the ACTUAL plague? An app just like Avoid Humans is sure to come our way sometime soon and, until then, there are similar ones you could use in its place, although — unfortunately — they don’t cater to the same general disdain for humanity.